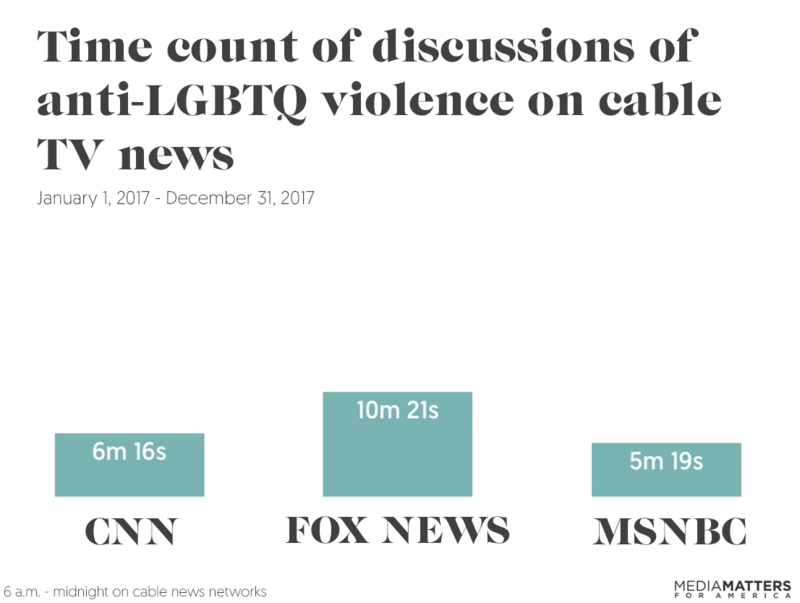 A Media Matters analysis of broadcast and cable news found that networks discussed anti-LGBTQ violence and homicides only 22 times for less than 40 minutes across seven channels in 2017, even though it was the deadliest year in hate violence against the community since at least 2012. 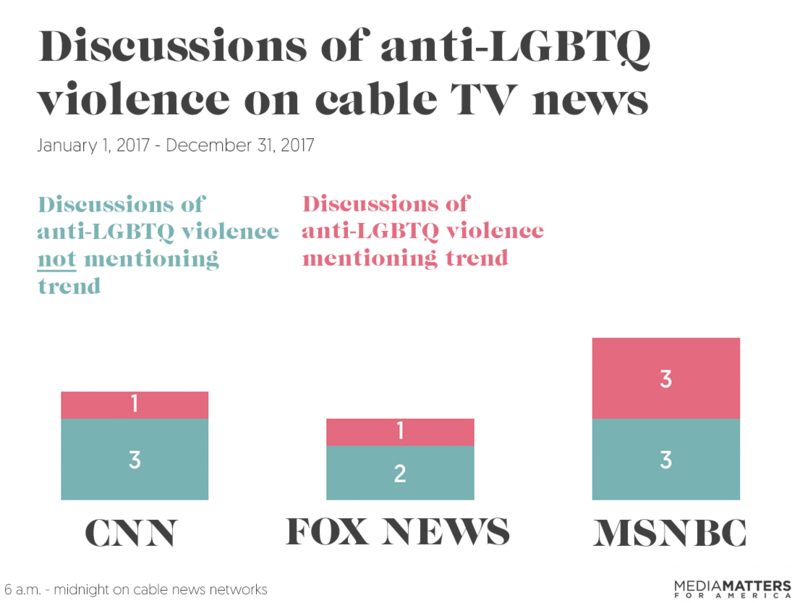 The majority of the coverage was about two specific stories and came on just four days, and the networks rarely noted the trend of increasing anti-LGBTQ violence nationwide in their coverage. 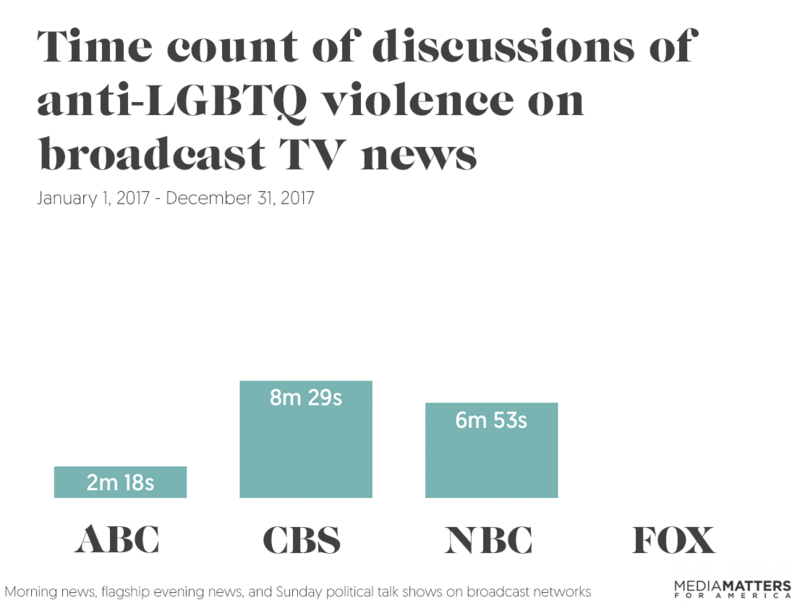 Across seven networks, anti-LGBTQ violence was discussed only 22 times for a total of 39 minutes and 36 seconds. Speakers contextualized their subjects as part of an overall trend of increasing violence against the LGBTQ community in only seven of the 22 discussions. Discussion of two stories -- the death of Scout Schultz and Attorney General Jeff Sessions’ decision to send a hate crimes prosecutor to investigate the 2016 killing of Kedarie Johnson -- comprised more than half of all discussions about, and time spent covering, anti-LGBTQ violence. Stories about Schultz’s death occurred over a three-day period, and stories about Johnson’s case all occurred on one day. Though Fox News spent the most time covering anti-LGBTQ violence -- at 10 minutes and 21 seconds -- most of that coverage came from one 7.5-minute segment featuring a disgraced police detective who defended the police officer who shot Schultz. 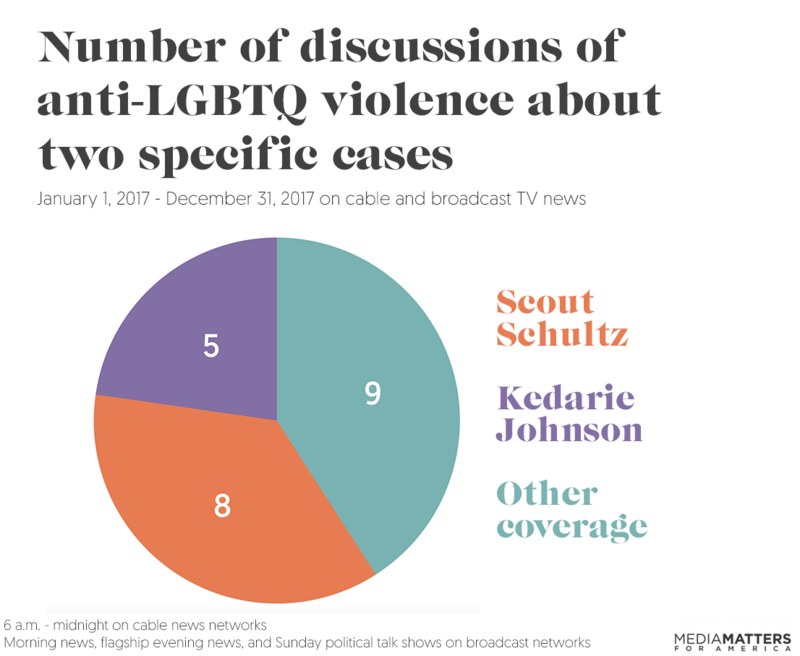 Throughout 2017, cable and broadcast news shows discussed anti-LGBTQ violence only 22 times. 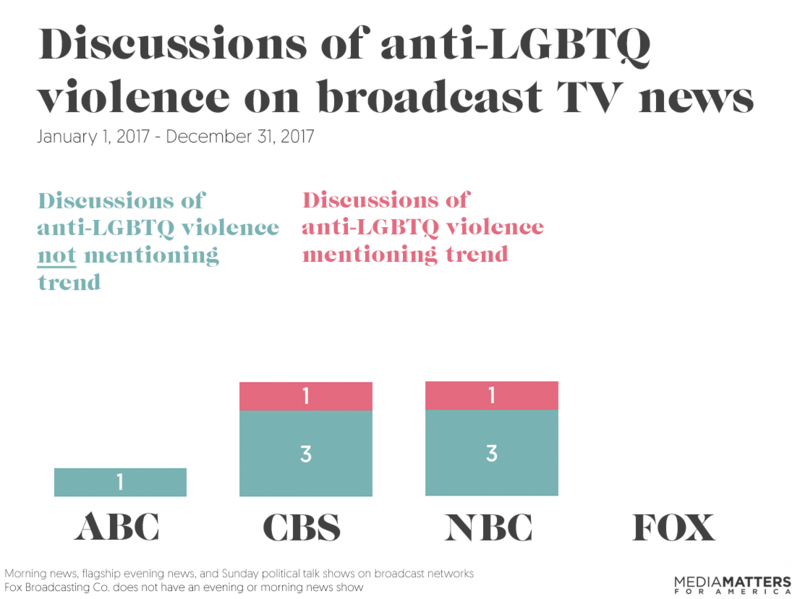 An analysis of programming between 6 a.m. and midnight on CNN, MSNBC, and Fox News and on the morning shows, flagship evening news programs, and Sunday political talk shows on broadcast stations ABC, CBS, NBC, and Fox Broadcasting Co. found that networks discussed hate violence against the LGBTQ community only 22 times in total in 2017. MSNBC had the most discussions, with six pieces of coverage, and ABC News and Fox Broadcasting Co. had the least coverage, with one and zero segments, respectively, although Fox does not have morning or evening news programming like the other broadcast networks. 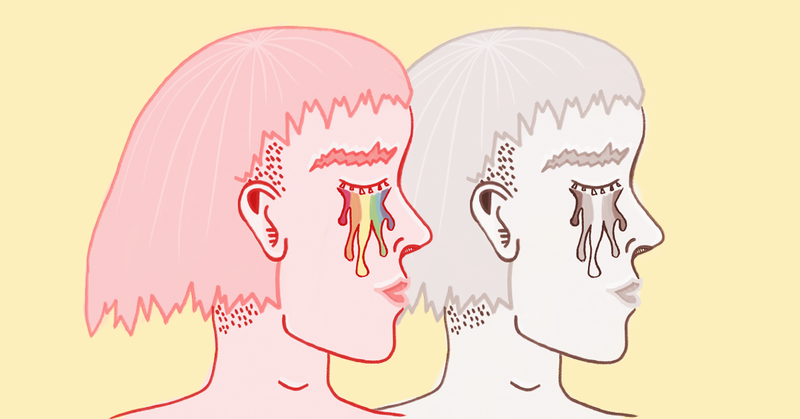 Only seven out of the 22 discussions of anti-LGBTQ violence and its victims contextualized it as part of an overall trend of increasing violence against the LGBTQ community. Only seven segments discussing anti-LGBTQ violence and its victims mentioned or alluded to an overall growing trend in anti-LGBTQ hate violence, with all seven also noting in some way the trend of increased violence against the transgender community. All 15 discussions that failed to contextualize the trend were about specific murders of LGBTQ victims (for instance, not one of the 13 segments about Johnson or Schultz mentioned the trend). We deemed coverage as contextualizing the trend in anti-LGBTQ hate violence if it specifically mentioned an increase in anti-LGBTQ violence, acknowledged the high rates of violence against LGBTQ people, or noted several instances of anti-LGBTQ violence within a specified time frame. We also searched for the names of all 52 anti-LGBTQ homicide victims in 2017, using the name or names listed in the NCAVP report: Mesha Caldwell, Jamie Lee Wounded Arrow, Sean Ryan Hake, Savyon Zabar, Bill Denham, Dontae Lampkins, JoJo Striker, Jaquarrius Holland, Keke Collier/Tiara Richmond, Chyna Gibson/Chyna Doll Dupree, Glenser Soliman, Ciara McElveen, Alphonza Watson, Andrew Nesbitt, An Vinh Nguyen, Kenne McFadden, Bruce Garnett, Chay Reed, Mx. "Kenneth" Bostick, Earl English, Imer Alvarado, Sherrell Faulkner, Kevin Wirth, David Swartley, Matthew Murrey, Josie Berrios/Kendra Adams, Neil Rodney Smith, Ava Le’Ray Barrin, Michael “Chris” Jones, Ebony Morgan, Robert Lee Covington, Rodriguez Montez Burks, TeeTee Dangerfield, John Jolly, Jaylow MC, Juan Javier Cruz, Gwynevere River Song, Kiwi Herring, Ally Lee Steinfeld, Anthony Torres, Derricka Banner, Scout Schultz, Elizabeth Stephanie Montez, Candace Towns, Giovanni Melton, Sydney Loofe, Brooklyn BreYanna Stevenson, Brandi Seals, Shanta Myers, Brandi Mells, Kerrice Lewis, and Kaladaa Crowell. Media Matters also searched for a number of variations and potential misspellings of the victims’ names. We also searched Nexis transcripts of Fox Broadcasting Co.’s Sunday show Fox News Sunday (the network does not have an evening or morning news program) for the same terms. Any reruns of programming were not included in analysis. Additionally, Media Matters conducted the same searches on iQ media for the above terms and names appearing on MSNBC’s and Fox News’ programming between 6 a.m. and midnight for the same time frame, as full transcripts from shows on these networks’ daytime programming are not available on Nexis. The iQ media search of Fox News and MSNBC coverage was limited by iQ media’s transcripts. We excluded from the study coverage of anti-LGBTQ violence in other countries such as Chechnya and Saudi Arabia, updates on past instances of anti-LGBTQ violence like the murders of Harvey Milk and Gianni Versace, and coverage of the 2016 massacre at the Pulse nightclub, an LGBTQ bar in Orlando, FL. When we found the above terms, we included the segments if the stated topic of discussion was anti-LGBTQ violence in general or instances of anti-LGBTQ violence, such as a specific anti-LGBTQ homicide, or if there was significant discussion of the topic. We defined “significant discussion” as a back-and-forth exchange between two or more people; passing mentions were not included in the analysis.